Nice family shot and excellent work. Just caught up on this thread. Wish I'd been more active earlier. The wheel jig seemed to work fine and kept everything more or less in line. Not perfect by any means, but probably better than the originals! Terry: I'm embarrassed to say that I've only just seen your post regarding the expansion link. I made an expansion link and die block in gauge plate to the LSM drawings, but that was for somebody on the TT forum. He had a professionally built engine, but it was rather worn and he was replacing parts as required. Once I get on to the motion work I plan to re-design the valve gear, but that is quite a way in the future. Some people say that the LSM valve gear design leaves something to be desired, but others who have engines built to the drawings say they run fine. Take your pick! I'm getting better at arc welding. Once I've finished all the wheels I'll be good enough to start again and make the wheels to a proper standard. The next welding job is to turn 32 quadrants into the T-rings for the rear wheels. Elsewhere on this forum I mentioned that I'll try and post about a few more parts already made for my traction engines. For those that want more detail I run a build diary on TractionTalk under sobriquet 'oly2brf5'. On the same forum I am running a theory thread, although it has been in obeyance for a while due to work pressures. On the Model Engineer forum I am also involved in a thread on the theory and design calculations for steam injectors, although again it is temporary obeyance. Now on to parts - in this post bevel gears, because I like gears. My traction engines have a differential based on two bevel gears and three bevel pinions. Traditionally there are two ways to cut approximations to bevel gears using standard equipment. The first method uses an involute gear cutter, takes three passes and results in a tapered tooth form. The first pass is on the axis, followed by two offset passes that widen the space between teeth at the outer edge of the gear. I have made bevel gears using this method in the long distance past. However, there are two problems, the first concerning the involute cutter. It has the correct curvature for the involute form at the outer edge of the teeth, but since it has to pass through the narrower gap at the inner end it is narrower than a standard cutter of the same DP. These cutters are normally stamped 'BEVEL'. 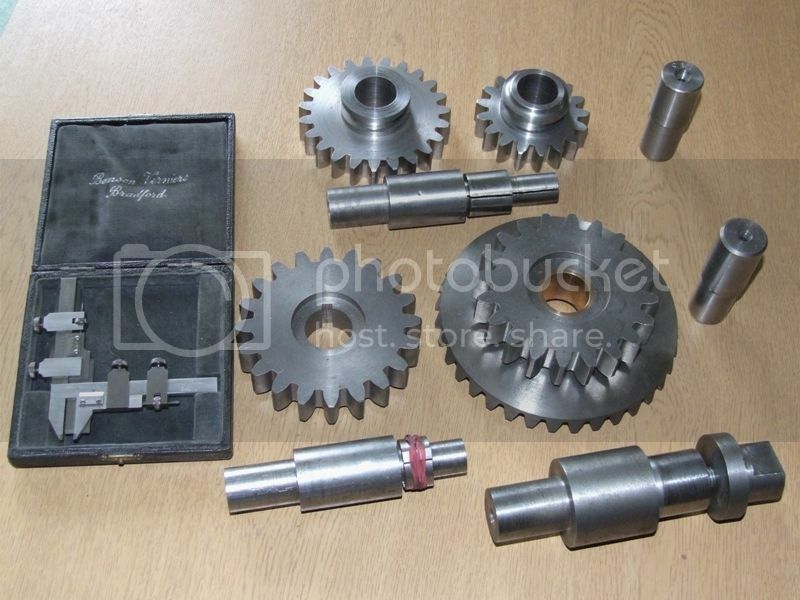 However, they do not seem to be available now - when I made the bevel gears all those years ago I had the facilities of the Royal Aircraft Establishment main workshop at Farnborough behind me. The second issue is the curvature of the teeth at the inner edge is not correct, and needs adjusting with a file or similar. The second method treats the teeth as being constant depth, and can be cut in three passes with a standard involute cutter. However, in this method the gears are designed using the DP at the inner edge, not the outer edge as is standard. This means that it is very difficult to design gears to fit into an existing design while retaining an integer value for the DP. 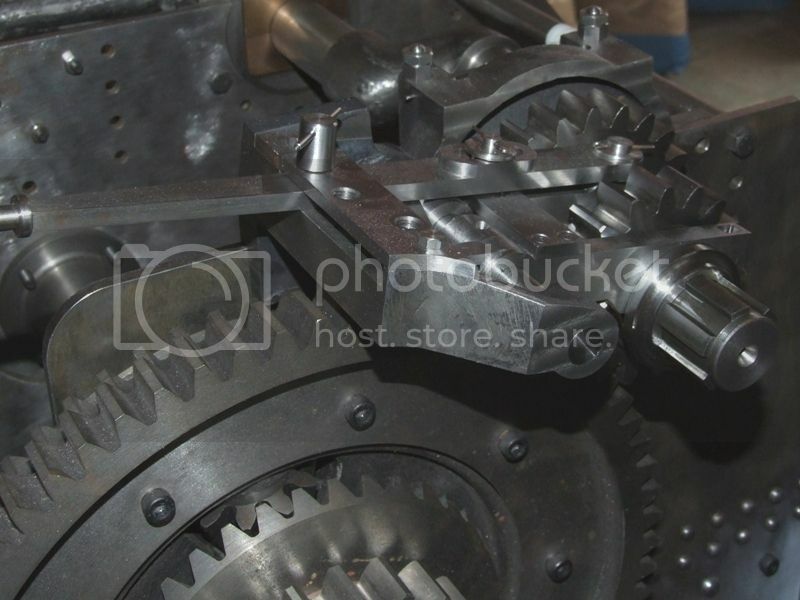 The observant might note that the teeth on the bevel gears look rather rack like for a 36 tooth gear. This is because the shape of the tooth is determined not by the number of teeth on the bevel gear, but on the 'equivalent' spur gear. The number is given by the number of teeth on the bevel gear divided by the cosine of the face angle. For my pinion this gives a value of 10.3 instead of 10, so use 10 teeth, ie, no change. However for the gear we get a value of 134.5 instead of 36, so use 135 teeth. The method is known as Tregold's approximation. To get the CAD models for the 6DP gears I need just use the CAD to scale the gears by one sixth. For scale the ring spur gears are 10.833" and 11.833" OD. Note that the three pivots for the pinions (centre of picture) have a threaded hole in the end. That's so one can get the darn things out if disassembly is needed without having to resort to naughty words. In due course I'll write a few words on the differential centre and ring gears. Following on from my previous post here are a few notes on the differential centre and ring gears. The observant will note that the differential centre is painted red, or not, in some pictures. I forgot to take any pictures of the machining of the differential centres when I did mine. A while later I cut the pinion slots and cut the ring gears for a friend who is building the same engine. He had already protected his differential centre with red paint. The slots into which the bevel pinions fit were cut using the rotary table. The rotary table is set up so that the T-slots are aligned with X and Y axes on the mill when the table reads zero. The DRO is set to zero at the centre of the rotary table. 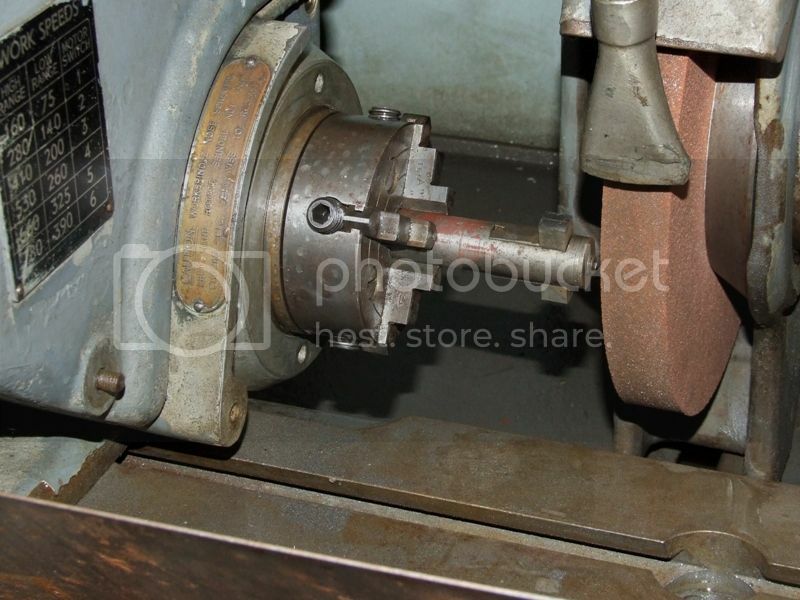 The differential centre is mounted central and such that one of the slots aligns with a T-slot on the rotary table. The four corners of each slot can then be co-ordinate 'drilled' using the milling cutter. The top and bottom of each slot can then be cleaned using the X axis on the mill table. The position and width of the slots are important as they control the engagement of the bevel pinions and gears. 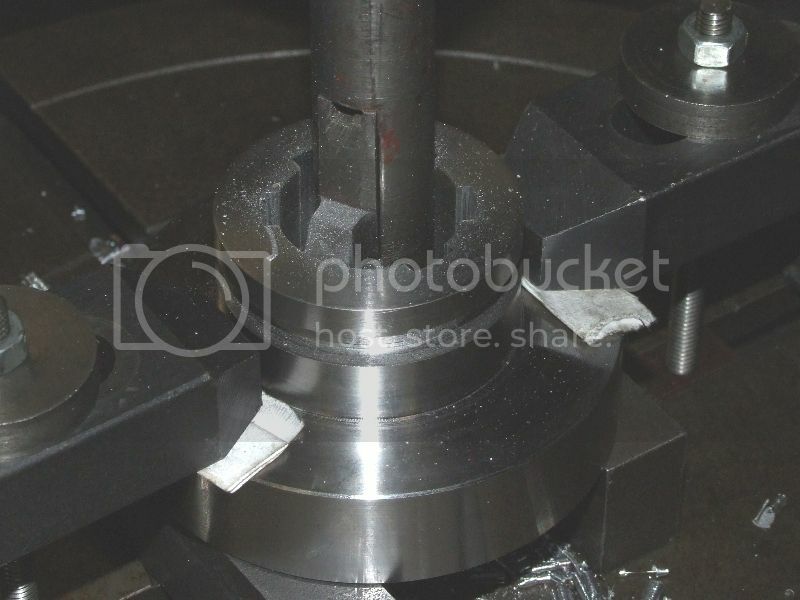 The sloped sides of the slots are machined by turning the rotary table ±22° around each slot and then using the Y axis of the mill to join the holes in the corners, by eye. The sloping sides are for clearance only. Note the special green clamp! In an ideal world the cutting forces from the involute cutter should create no torque on the gear. I cut all the small spur gears for the engine with no problems. However, on the first 69 tooth gear the cutter didn't cleanly enter the first tooth once I'd been round once - it was about 15 thou out. I spent ages checking and re-checking the maths and the indexing. This showed that only the last few teeth were out, so near the end the darn gear must have slipped slightly. Although it couldn't be seen it annoyed me, so I scrapped the gear, bought another casting and did it all again. This time the green clamp holds the blank against a small angle plate bolted to the mill table for each cut. You live and learn, and the wallet suffers in silence. I bought them through 'Model Engineer' some time in the late 1980s. I recall there being some problem with delivery. Being a fully paid up member of the awkward squad I regularly rang the advertising manager at the publishers for about a year, until she decided it was easier to get the problem sorted, as I wasn't going to go away otherwise. The 6DP involute cutter for the ring gears was the only one I bought new. I ended up buying from Victornet (?) in New York. Of course it's an 'import' but at least it is 20°PA. Although such cutters are available in the UK they all seem to be 14½°PA, but I'd already decided to use the more modern 20°PA. All the other 6DP, and 5DP, cutters I needed, plus a few I didn't, were bought secondhand from the US via Ebay - bargain. Thanks Terry. Progress on the wheels is frustratingly slow. One problem being that it's not worth getting the welder out and everything set up for an hour or so, but finding several consecutive hours is an issue. If nothing else the gliding club membership is finally coming out of hibernation and I'm getting lots of requests to review and sign off the ARC (Airworthiness Review Certificate) for assorted gliders. It takes quite a few hours for each review. The ARC is a legal document certifying that the glider is airworthy and hence fit to fly. So one doesn't want to make a boo-boo! This thread seems to be attracting a steadily increasing number of views, but no comments. I'm not sure if that's good or bad? Anyway, here are a few more gears, specifically the crankshaft pinions and final drive pinions. Here is one set of pinions, along with the arbors for holding them during gear cutting. On the right are a couple of ground arbors to check the bore size. On the left is a gear vernier. When I first started cutting gears I did a roughing and finish pass with the cutter and checked the tooth width with the verniers. It turns out I was wasting my time. I now cut gears in one pass; all that two passes does is wear out the cutter. Likewise the gear verniers weren't much use. 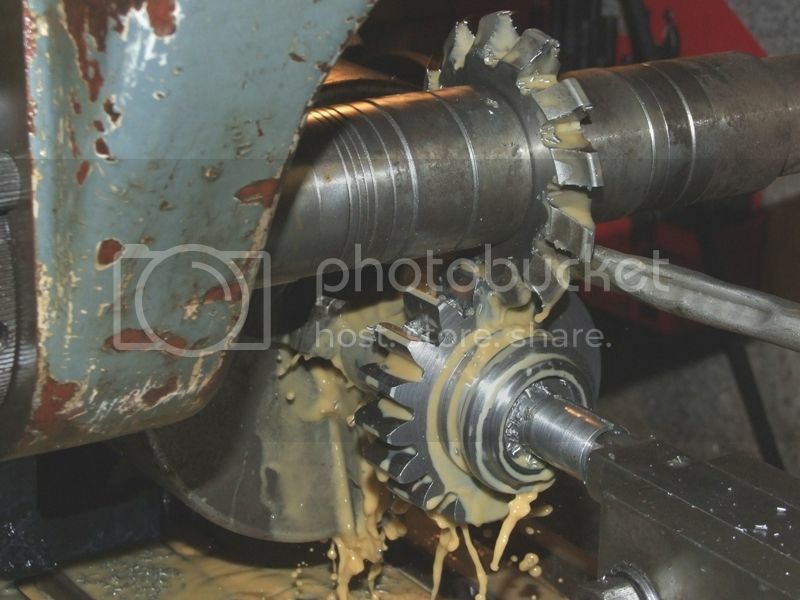 For non-precision gears like these it is fine to touch off the cutter on the OD and then move the mill by the theoretical depth of the tooth and commence cutting. You live and learn. Unless of course you do something really daft and get a Darwin award. The crankshaft pinions as shown thus far have been scrapped. When I made the first set I was ignorant about machining EN8 and didn't get a good finish, as can be seen. I was also concerned about the fit of the splines and made the bore 10 thou bigger than specified for clearance. Sometime later, with more experience, I machined another set of EN8 gears for a mate, and got a much better finish. So I remade mine, and also reduced the bore to the proper size. I found that the key to a good finish on EN8 is surface speed. The new sets of pinions were machined at 800-1200rpm, using insert tooling. Don't worry about the lack of comments, just keep the updates coming ...PLEASE !! It's just gob smacking work, would be nice to sit & watch the work on the cutting of the gears. Andrew is that because we use involute cutters that will cover a range of tooth numbers, do the verniers only work with gears cut on a proper machine with a true form? What sort of feed does the slotting head need, I did mine the hard way planing in on the lathe and 0.001" per pass was all I wanted to lhe the lathe cope with, at least the Fowlers are flat topped. Looking good, I hope the start of the flying season won't slow progress too much. Bad Behavior has blocked 16004 access attempts in the last 7 days.